A lot of his posts so far have dealt with his early career at DC Comics and with the Legion of Super-Heroes and some broader commentary on Marvel Comics in the 1970s. “He was never the Avenger who saved the day at the end and usually the first knocked out or captured. His most notable “achievement” in the lab was creating Ultron. Meanwhile, his rich, beautiful wife succeeded in everything she tried. She was also always flitting around his shoulders, flirting, saying things to prop up his ego. Interesting that such a miscommunication has rippled through the Marvel universe and shaped many Avengers-related storylines. 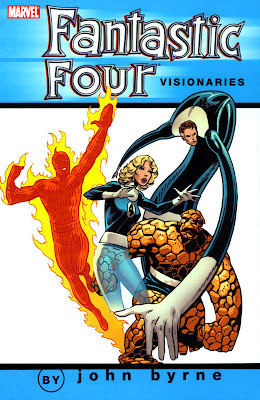 John Byrne's Fantastic Four Omnibus on its way! With the Simonson Thor Omnibus a little over a month away, could a FF Omnibus be far away? 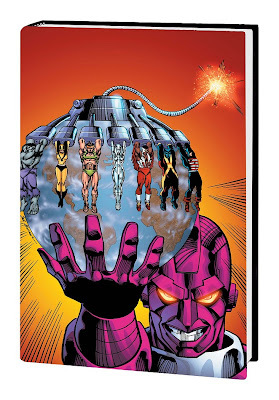 confirming a John Byrne Fantastic Four Omnibus! No release date though. 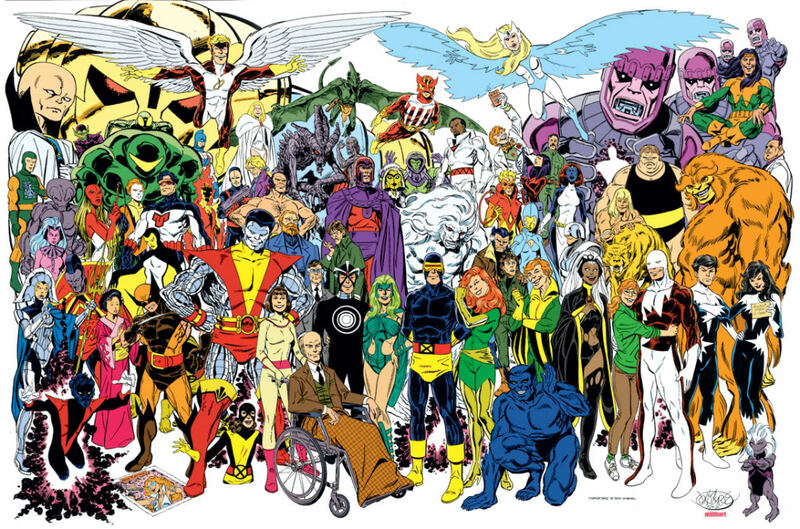 Also confirmed, more New Mutants Classics and Alpha Flight reprints, as well as a collection of 1980s silver surfer sometime next year. You see it every time you load up my blog. 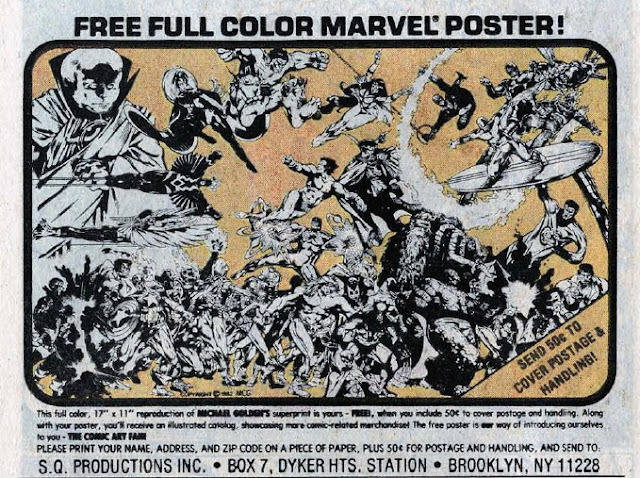 Here's the wonderful poster from Michael Golden, who I had the pleasure of meeting last weekend at Wizard World Toronto, with out the Marvel Comics of the 1980s text. As a kid, I foolishly send off 50 cents to S.Q. Productions Inc in hopes of getting my greedy little fingers on this amazing poster. Unfortunately, I never did. I'm assuming it was because I was from Canada. However, that never diminished my love for the poster even in its tinie-tiny size! was the 11"x17" poster or "superprint". And here's the more recent print version. Not a big fan of the recolouring though. 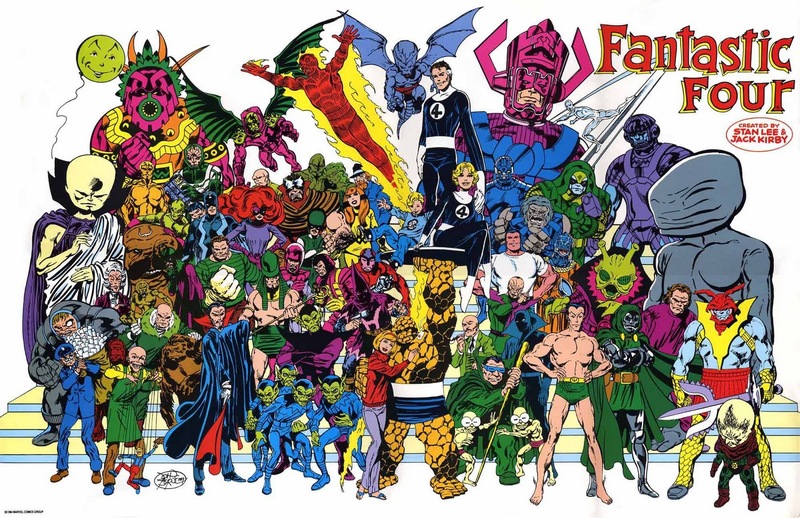 As a huge fan of John Byrne's 1984 poster of the Fantastic Four. 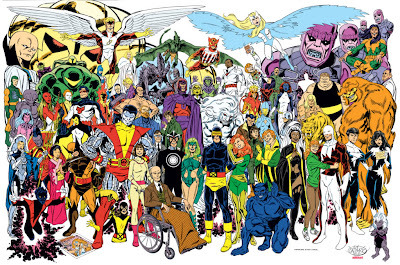 I was blown away when I came across Byrne's similar approach on the Uncanny X-Men. 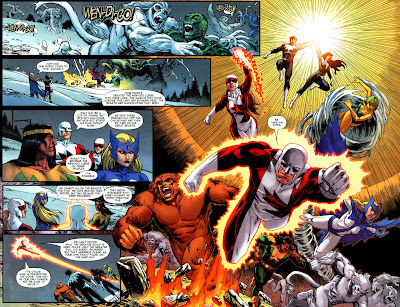 As you might know, I’m Canadian and a big fan of John Byrne’s Alpha Flight. I followed the title after he left, but the Mantlo-Mignola-Ross run never recaptured that magic. 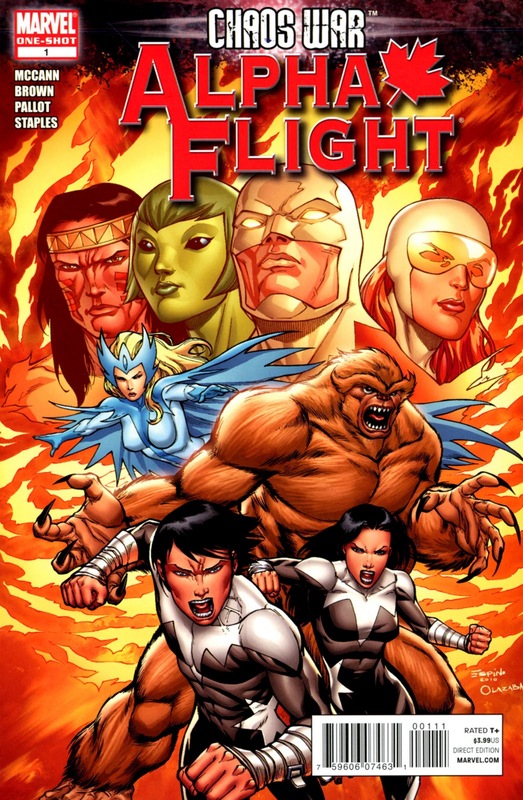 I’m hesitant to get excited about this upcoming miniseries as I’ve been disappointed time and time again with Alpha Flight reboots. What might make this reboot different? Greg Pak. I really enjoyed his Emperor Hulk run and how he juggled a broad cast of characters. Fred Van Lente. His Incredible Herc run was ... well... incredible. So, for the first time in over two decades, I’m excited again about Alpha Flight. Do you fear…your country turning on you? Alpha Flight has long been the protector of an entire nation…but what happens when that nation needs to be protected from itself? 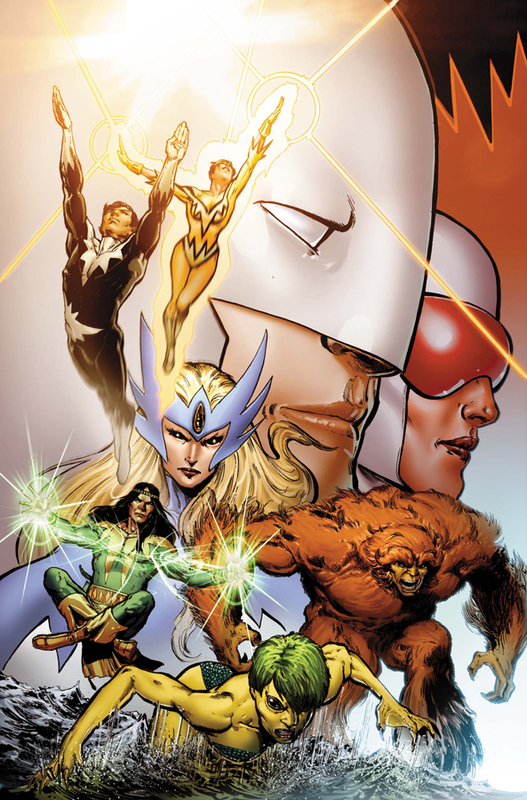 New York Times best-selling authors Greg Pak and Fred Van Lente, along withred-hot artist Dale Eaglesham, bring back the team you demanded—the original Alpha Flight! Sasquatch, Snowbird, Northstar and Aurora have been joined by their revived allies Guardian, Vindicator, Shaman, and Marrina as the paragons and protectors of an entire nation. But as FEAR ITSELF takes over, their own country turns on the Flight and brands them traitors for the shocking actions of one of their closest allies. 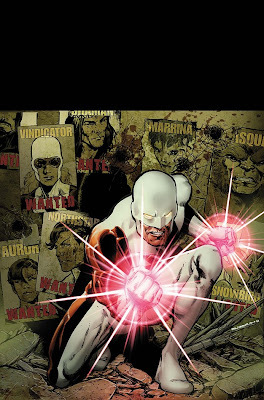 As the borders close and an entire nation hunts them down, will the newly reunited Alpha Flight survive? Old time fans will enjoy seeing things referenced, but you won't have had to read any past Alpha Flight books or Chaos War to pick it up. As a result of Fear Itself, there is a change in government, and so Alpha Flight finds themselves as the country's "greatest traitors," and they must go on the run and figure out what is behind the government takeover. It was Fred [Van Lente]'s favorite comic growing up, so this is a dream come true for him. 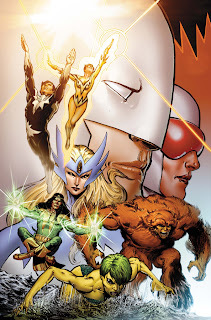 He describes himself as a walking encyclopedia of Alpha Flight knowledge, while Greg Pak comes into it with a relatively clean slate, but he loves these characters. Fred also wants to emphasize that this is the original team from UNCANNY X-MEN #120, and we've never seen that team really work together before. Fred: They're using the clean slate provided by Chaos War to do a ground-level reboot. They're not ignoring everything that's come before, but they're not going to be referring to a character's multiple resurrections or anything like that. They don't want to get bogged down in the continuity. "Basically, if John Byrne didn't come up with it, we're throwing it out," said Van Lente who noted that through no intentional malice, the team had been subjected to a lot of bad continuity over the years. "I wouldn't say we're ignoring everything that came later, but we're not going to be referring to an individual character's multiple resurrections over the years...this is one of those stories that wants to start with a clean slate,” Pak added. Collecting material from X-FACTOR ANNUAL #3, PUNISHER ANNUAL #1, SILVER SURFER ANNUAL #1, NEW MUTANTS ANNUAL #4, AMAZING SPIDER-MAN ANNUAL (1964) #22, FANTASTIC FOUR ANNUAL #21, UNCANNY X-MEN ANNUAL (1970) #12, WEB OF SPIDER-MAN ANNUAL #4, WEST COAST AVENGERS ANNUAL #3, SPECTACULAR SPIDER-MAN ANNUAL #8 and AVENGERS ANNUAL #17. Captain America! Thor! Namor! Hercules! Black Knight! She-Hulk! Captain Marvel! Dr. Druid! Wasp! 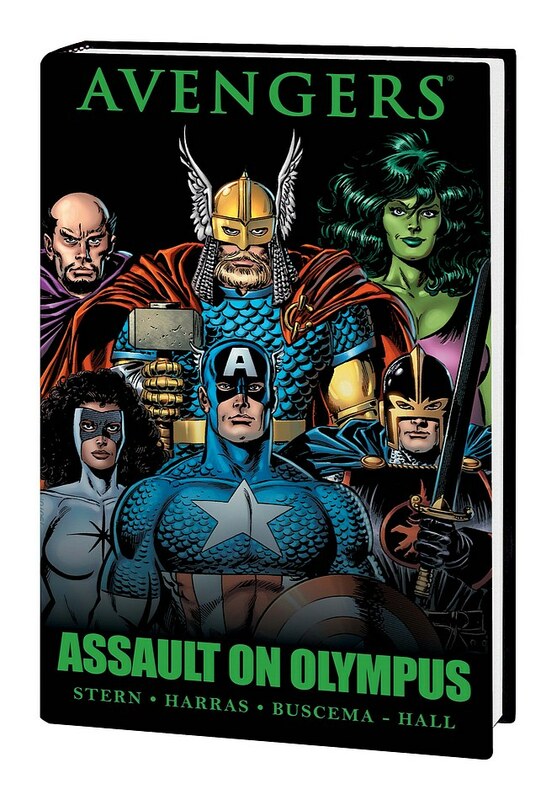 See the Avengers storm the very gates of Olympus to battle an entire pantheon of all-powerful gods! Do our heroes stand a chance? Plus: from the Thunderbolts, Moonstone! And Jarvis stands alone! Collecting AVENGERS #278-285. After their breakup, Black Cat drifted off into that Negative Zone where second string characters go, waiting to be called upon again. And she did return with a vengeance a year later in Peter Parker the Spectacular Spider-Man #112 (Mar. 1986) under writer Peter David. While reprising her role as a costumed vigilante, the Black Cat’s tone changed from her usual self-absorption to something altruistic. She found a compromise between the thrill of her former criminal lifestyle and being a superhero by adopting a Robin Hood like role, stealing from the bad guys and turning over the loot to the poor and needy. However, despite making it on her own as a superhero without Spider-Man, life threw Felicia a curve. Her bad luck powers had suddenly disappeared (Peter Parker the Spectacular Spider-Man #115, June 1986). 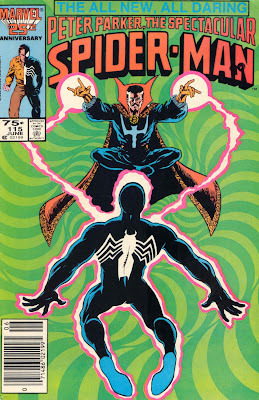 It turned out that Spider-Man was still suffering the lingering effects of Black Cat’s bad luck powers and sought out Dr. Strange’s help. Dr. Strange freed him of those influences by going directly to the source and eliminating them. After taking a serious beating as she’d come to depend on those bad luck powers, a new Black Cat reasserted herself. She marked this new direction by donning a new Black Cat costume. Felicia tracked down Dr. 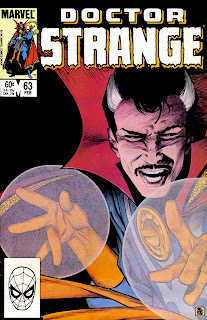 Strange and learned that he didn’t actually eliminate her powers, but rather altered them. Her physical abilities were all heightened in proportion to a cat, including night vision and retractable claws. She then confronted Spider-Man in Peter Parker the Spectacular Spider-Man #116 (July 1986) and blamed him for the loss of her bad-luck powers. Their heated argument allowed Felicia to unload all of her pent-up anger and frustration over how their relationship ended. Shortly after, the Sabretooth attacked her, but Spider-Man came to her rescue. Felicia was offended by his rescue, feeling that she could have handled Sabretooth. 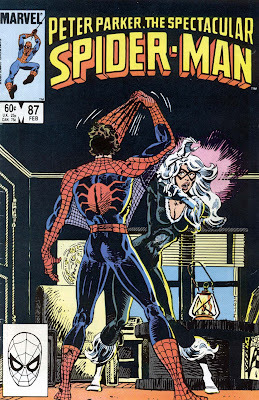 However, in Peter Parker the Spectacular Spider-Man #119 (Oct. 1986), Felicia got her re-match against Sabretooth. 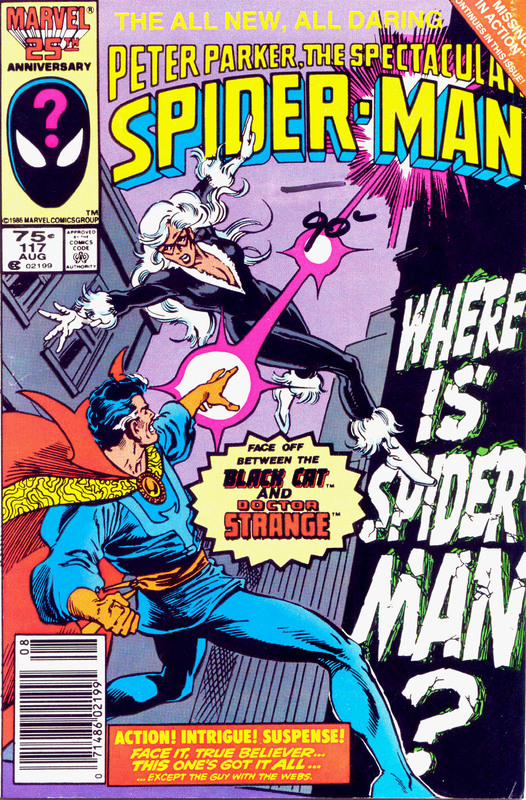 One of the side plots Peter David was exploring was how the Black Cat was more than a secondary character. Before their battle, Felicia purged herself of her unhealthy feelings towards Spider-Man and accepted their new status as friends. 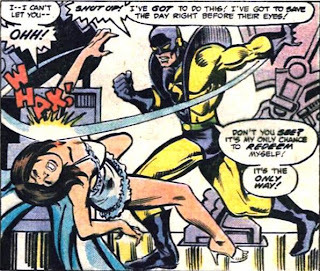 That commitment was quickly put to the test as she knew Peter was watching her fight with Sabretooth. Although Sabretooth came off as a cathartic punching bag, their brutal battle ended with Felicia’s triumphant victory. She topped off this emotional moment by winking at Spider-Man who had come onto the scene late. Unfortunately, she again fell prey to a new mysterious adventurer, the Foreigner. She agreed to work with him to make Spider-Man’s life miserable. As she helped bring the Foreigner’s plans to fruition, she realized that she still had strong feelings for Spider-Man. She double-crossed the Foreigner and saved Spider-Man’s life. Fearing for her safety, Felicia fled to Europe to start fresh. In the late 1980s, donning her classic costume, Felicia returned to North America and set her sights once again on Spider-Man (Amazing Spider-Man #331, Apr. 1990). She was mortified to learn that in her absence Peter Parker had married Mary Jane Watson. The news was devastating to Felicia. She loved and adored Spider-Man and believed that he loved her despite her flaws. To see him in love with or even care for someone else, amplified the pain of the loss of their relationship and what might have been. 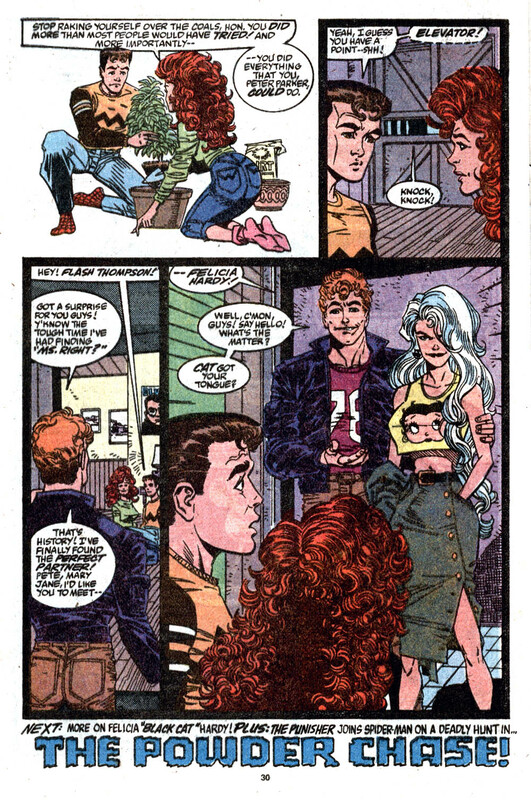 Insanely jealous and determined to make Peter realize he had married the wrong woman, Felicia started a relationship with Peter’s longtime friend, Flash Thompson. Felicia’s game put Peter in an awkward position as Peter couldn’t tell Flash what was going on without risking his secret identity. Fortunately, cooler heads prevailed and Felicia and Peter are forced to patch things up as a series of threats required their combined efforts. What actually undid her this time was her feelings for Flash Thompson. In Spectacular Spider-Man #209 (Feb. 1994), Felicia proposed to Flash, realizing she was actually in love with him. However, Thompson refused her proposal not because she used him, but because he felt it would only be a matter of time before she left him or resented him for tying her down to a normal life. What Thompson didn’t know was that she was ready to settle down, feeling that she could love someone normal. Confronting this issue was difficult for Felicia as well, realizing that had she been able to come to terms with it earlier, she might still be with Spider-Man. In 2002, Kevin Smith penned a new Black Cat miniseries, Spider-Man/Black Cat: The Evil That Men Do. While this miniseries was infamous for its delay, which finally saw completion three years later in 2005, Smith had retconned her origin. The miniseries revealed that when Felicia was a freshman student at Empire State University, she had been raped by her boyfriend, Ryan. Refusing to report the assault, she channeled her anger into training and learned a variety of martial arts. She dropped out of school and focused solely on preparing to kill Ryan. However, she was robbed of her revenge, learning that her ex-boyfriend was killed in a car accident. With nothing to lose, she turned to a life of crime. While Felicia carried unresolved issues from her childhood, she is sane from a reasoning and cognitive point of view. Felicia is capable of experiencing guilt, accountability, and compassion. She knows the difference between right and wrong, but doesn’t always make the right decisions. While guilty of making wrong and self-serving choices, there’s little evidence of any true psychological disorder. It’s also important to keep in mind that over the years, Felicia’s character has been handled by many writers, each with their own take on her. In fact, it wouldn’t be hard to argue that most comic book characters have mild forms of schizophrenia or multiple personality disorders. A solid testament to her character is how she has become an integral part of Spider-Man’s life, accompanying him through comic book revamps and alternate versions, and into other media like TV shows and video games. And as for her relationship with Spider-Man, now that Mephisto has conveniently undone Peter and Mary Jane’s marriage, perhaps Felicia still has another chance at winning his heart. Osterweis, Marian, Bereavement: Reactions, Consequences, and Care, National Academy Press, 1984. Pines, Dr. Ayala M., Romantic Jealousy: Understanding and Conquering the Shadow of Love, St. Martins Press, 1992. Shulman, Shmuel and Seiffge-Krenke, Inge, Fathers and Adolescents: Developmental and Clinical Perspectives, Routledge Press, 1997. And that’s exactly what Bill Mantlo did in the pages of Peter Parker the Spectacular Spider-Man. Black Cat was Spider-Man’s girlfriend, not Peter’s. 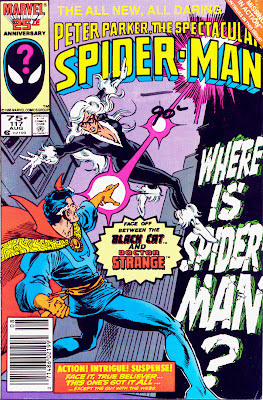 In Peter Parker the Spectacular Spider-Man #87 (Feb. 1984), Peter boldly revealed his secret identity to the Black Cat. She was the first girlfriend he had unmasked himself to. Until that point, Felicia was always uncomfortable and reluctant to see Spider-Man unmasked. She feared that the thrill and excitement of their mysterious romance would be lost if she knew who he really was. Her fears became concrete. 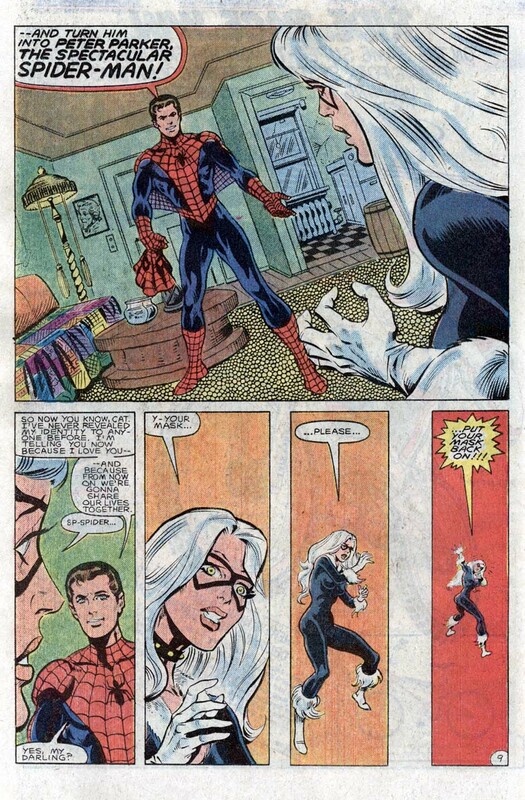 The panel sequence and framing of this scene amplified Black Cat’s reaction. 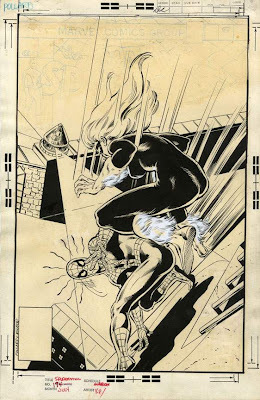 Artist Al Milgrom focused on Felicia with no background and pulled away from her in an almost Hitchcock-like progression, as if her fictional world was collapsing in on itself. It isn’t difficult to see how the internalized romantic image of her father was transferred to Spider-Man. In him, Felicia saw the partner of her dreams. The only problem was that romantic image of Spider-Man didn’t include the boring and ordinary, Peter Parker. 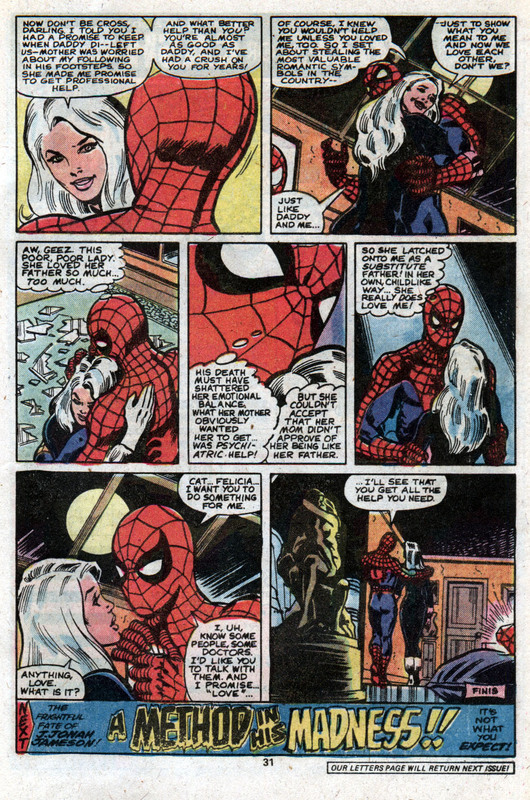 In the off-beat Amazing Spider-Man #246 (Nov. 1983), “The Daydreamers!”, Roger Stern gets into Felicia’s head. This story taps into Felicia’s daydreams and shows us her ideal version of Spider-Man who is a lovable rogue, her perfect companion-in-crime, and ridiculously wealthy. And to top it off, when Spider-Man takes off his mask, Cary Grant’s face is revealed and the classic movie, To Catch A Thief, is alluded to. After her brutal beating at the hands of Doctor Octopus, Spider-man had thought it best not to have a partner that didn’t have powers. However, Felicia convinced him otherwise. In her criminal days, to live up to her name’s sake, Felicia would set traps or obstacles in the area where she planned to commit her burglaries. For example, rigging shelves to collapse on her pursuers, allowing her to escape. Teaming-up with Spider-Man, she quickly developed an inferiority complex. She was only human, operating at an Olympic level in terms of her agility and speed, but still no match for the proportional powers of a spider. Felicia’s inferiority complex drove her to obtain super powers at any cost. While the Secret Wars had whisked Spider-Man away, Felicia went on a quest to gain superpowers. An underworld scientist, succeeded in unlocking Felicia’s latent power and enhancing it. However, Felicia was mortified to discover that the scientist was employed by the Kingpin and found herself awkwardly in his debt. With her new bad luck powers, as well as enhanced agility and speed, she rejoined Spider-Man with a renewed confidence. However, Felicia kept the truth of who was behind her powers from him. This secret became increasingly difficult to keep as those powers began to affect anyone around her, including Spider-Man. While the response was overwhelming, it wasn’t clear how readers actually felt about their relationship. 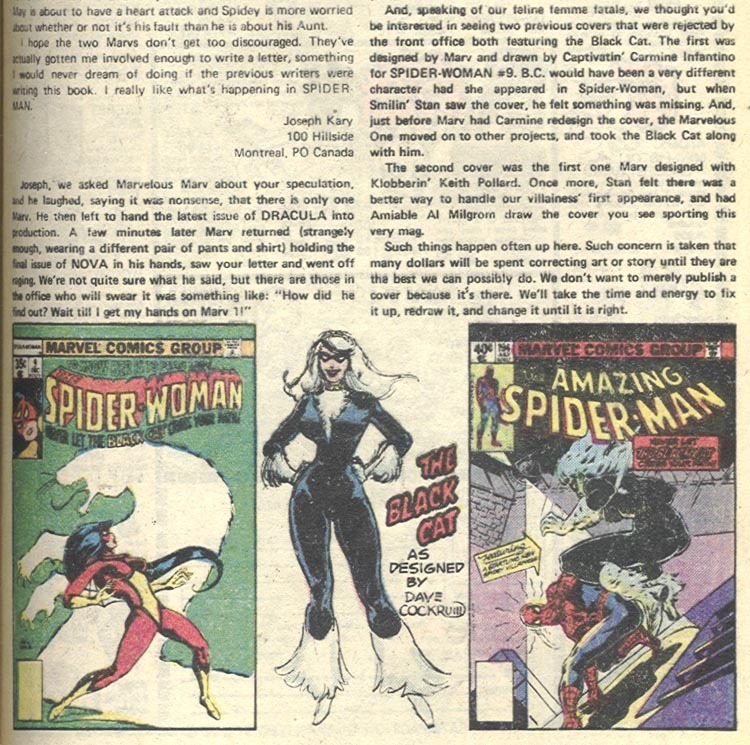 From the letter page in Peter Parker the Spectacular Spider-Man #82 (Sept. 1983): ”But you might be interested to know that not all our readers share your enthusiasm for a permanent Black Cat/Spidey union.” I was unable to aggregate any real numbers on fan opinion, but it wasn’t hard to see that it was divided. 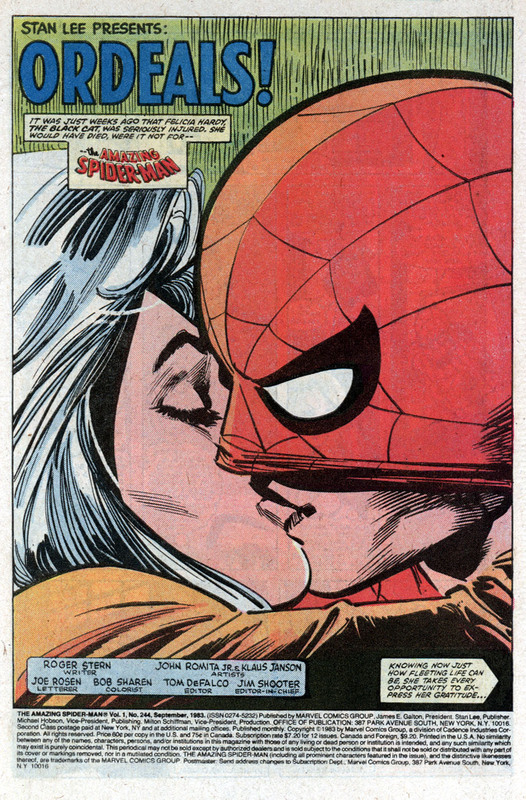 Having been an avid Spidey fan in the 1980s, my thirteen-year-old mind frame didn’t fully grasp the implications of their relationship. As someone who dreamed of being Spider-Man, I was similarly attracted to the Black Cat. At that age, or any age, who wouldn’t fantasize about the Black Cat being his girlfriend? Peter Parker was the nerd that readers could associate with and having such a glamorous and beautiful girlfriend was almost unthinkable. It was one thing being Spider-Man’s girlfriend, but being his crime-fighting partner was something different and never fit for me. Until then, it was Peter Parker that had girlfriends, like Gwen Stacy or Mary Jane, and he couldn’t share both sides of his life. 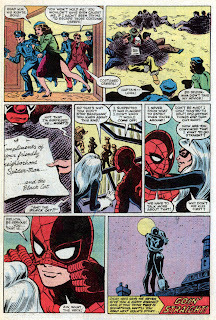 But, with Black Cat, Spider-Man ceased to be a loner and joined the ranks of other crime-fighting couples, like Mr. Fantastic and the Invisible Woman or Hawkeye and Mockingbird. You couldn’t help but be happy for Black Cat and Spider-Man as they seemed to have found something special in each other. However, it didn’t last. 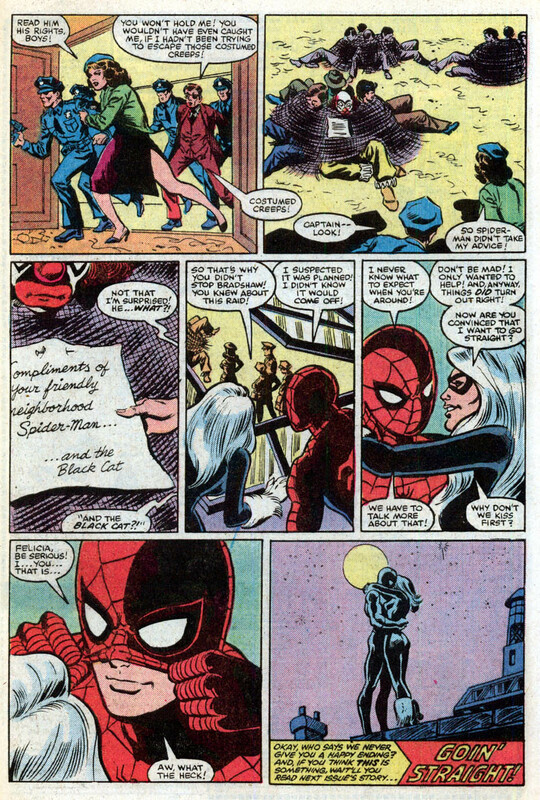 Unlike the other couples mentioned above, Black Cat wanted nothing to do with the Peter Parker side of Spider-Man’s life. Her reaction was the flip-side of his Peter Parker relationships who wanted nothing to do with Spider-Man. “It’s not that I don’t love you, Felicia – ‘cause in a way I do, you’re the most glamorous exciting girl I’ve ever known. But we’re so different … too different. You’re … I don’t know … Too amoral. I like adventure as much as anyone, but I do care about which side of the law I get my kicks on! 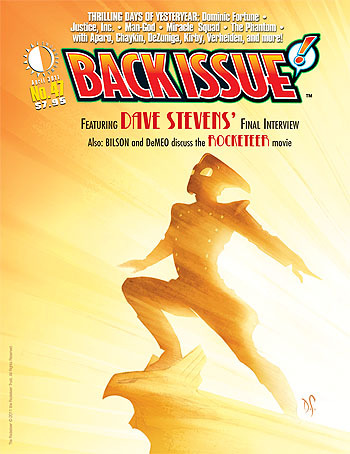 The final interview with the late, great DAVE STEVENS headlines BACK ISSUE #47, our “Thrilling Days of Yesteryear” issue (84 pages with 16-page COLOR section, $7.95)! Also, the film version of Stevens’ Rocketeer is discussed in a “Pro2Pro” interview with DANNY BILSON and PAUL DeMEO. Plus: The Phantom, Dominic Fortune, Man-God, Miracle Squad, and Justice, Inc. With art by and/or commentary from JIM APARO, HOWARD CHAYKIN, TONY DeZUNIGA, LUKE McDONNELL, MARK VERHEIDEN, and more. And featuring a Rocketeer cover by DAVE STEVENS! Edited by MICHAEL EURY. 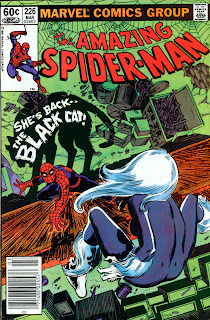 The Black Cat returned almost a year later, in Amazing Spider-Man #204 (May 1980), when her criminal exploits once again caught Spider-Man’s attention. Her interest in Spider-Man escalated and bordered on obsessive compulsive as she stole a variety of love-inspired object d’art to add to her Spider-Man collection. 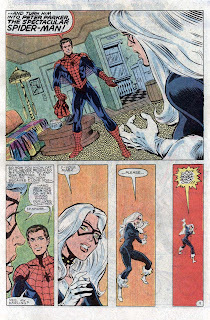 In the following issue, when cornered by Spider-Man in her hideout, Felicia proudly displayed a shrine devoted to him. Spider-Man was caught off guard by her obsession. Looking at this development, it isn’t hard to conceive that her emotional balance was shattered by the death of her father. Her mother didn’t approve of her following in her father’s footsteps, so there was no doubt Felicia was carrying around a lot of emotional baggage. A reasonable way to deal with such stressors was to turn towards the only other person she looked up to. 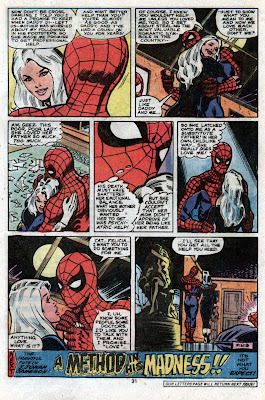 “I like the men in my life to be a little mysterious!” Felicia remarked about Spider-Man in Amazing Spider-Man #194. How can you get more mysterious than a masked superhero? With her father dead, Spider-Man became a substitute father figure and new role model in the fictitious world she chose to wrap around herself. However, on another level, you can put together a theory that she was merely feigning her emotional issues to try and get out of having been caught. 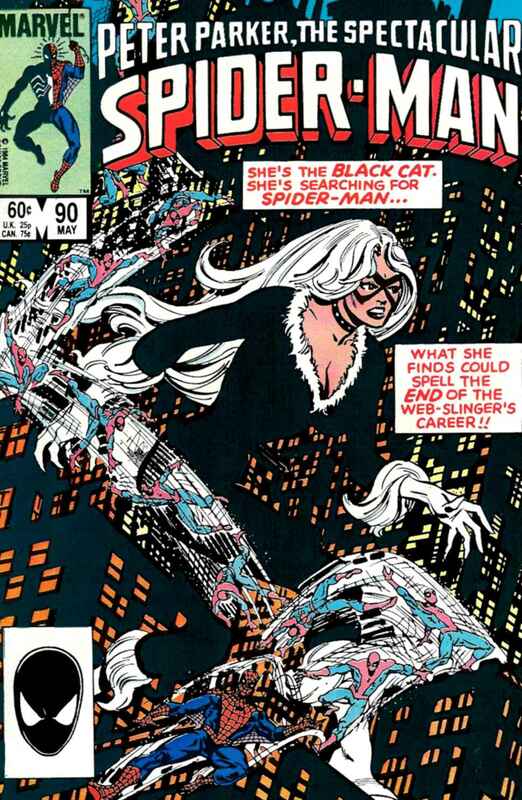 Former Spider-Man writer, Roger Stern fills us in: “the Black Cat had already been shown to be clever and conniving, right up until the end of Amazing Spider-Man #205. That's the issue where Spider-Man cornered Felicia in her lair, and discovered that she had a whole wall of photos devoted to him. He jumped to the conclusion that she had a psychotic obsession with him. Roger Stern definitely cast the Black Cat in another light. 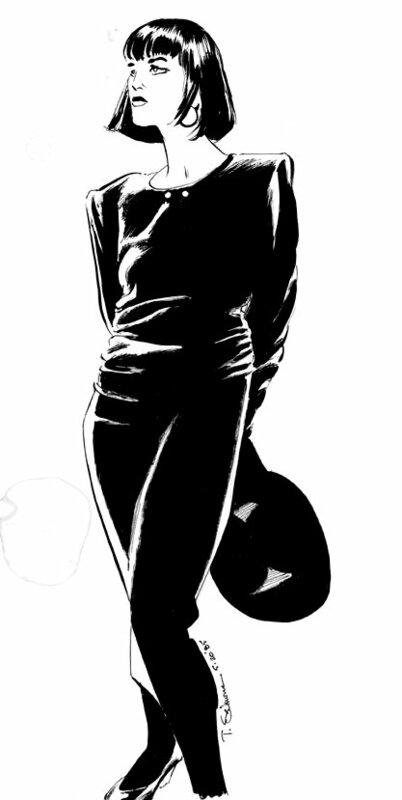 In her next appearance in Amazing Spider-Man #226 (Mar. 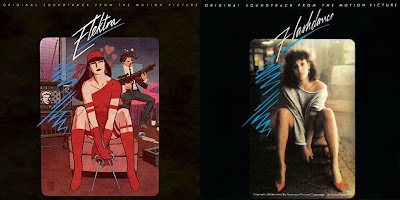 1982), he added more depth to her character, making her more intelligent and devious. Her ruse to feign mental illness was motivated by the fact that it was easier to escape from a mental ward than a highly-guarded prison. The Black Cat got embroiled in the Owl-Octopus war that ran through the pages of Peter Parker the Spectacular Spider-Man in early 1983. Black Cat exploited Spider-Man’s feelings for her and used him to protect her from the Kingpin who she had recently robbed. Both readers and Spider-Man were kept guessing as to whether or not Felicia’s feelings were genuine. 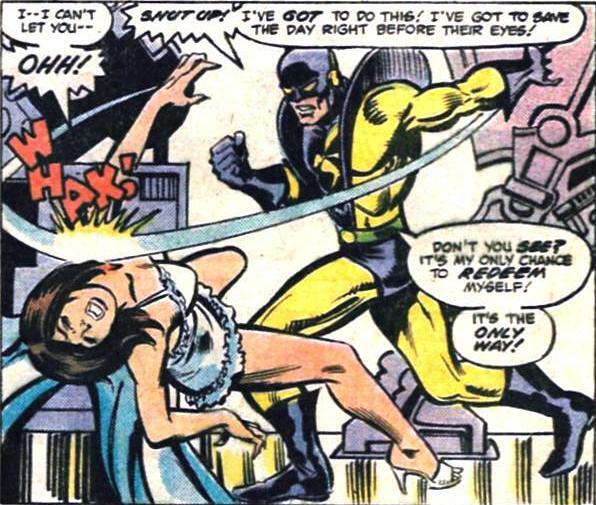 During the climax of this storyline, Doctor Octopus and his goons savagely beat the Black Cat. Fortunately, Spider-Man got her to the needed medical attention to save her life. Over the weeks she spent in the hospital, her feelings for the web-head solidified. She looked forward to his visits and the neutral setting of the hospital forced her to think about her role and how she wanted to be a part of Spider-Man’s life. “I’m going to go straight! No more cat burglaries – no more crime! I’m going to start living solely for the man I love!” She told Spider-Man in Peter Parker the Spectacular Spider-Man #78 (May 1983). 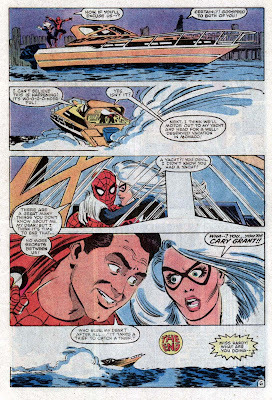 A few issues later, she drove their relationship in a new direction, hoping “when I was well again that we could continue as a team!” (Peter Parker the Spectacular Spider-Man #78, May 1983). This new direction not only had her playing on the right side of the law, it had her enforcing it as a superhero. Interestingly, their relationship continued without Felicia knowing Spider-Man’s true identity; a fact that didn’t seem to bother her. Obviously, not only in the readers, but in Felicia as well, as that level of excitement was infectious and drove her attraction to him. Felicia is human, no different in feeling vulnerable and insecure, but, when she met and fell in love with Spider-Man, those feelings magically disappeared. Interestingly, when you compare and contrast Felicia Hardy/Black Cat and Peter Parker/Spider-Man, they’re dual opposites. And, of course, opposites attract. Felicia Hardy is terribly self-absorbed whereas Peter Parker is giving to a fault. She’s reckless, while his responsible nature is his character’s cornerstone. Felicia loves the thrill she gets from her unlawfulness antics whereas Spider-Man respects the darker side of his vigilantism. She has no secret identity; the Black Cat is simply Felicia with a mask. Whereas Spider-Man is Peter Parker's alter-ego. Peter becomes a different person when he puts on Spider-Man’s mask. Felicia has nothing to hide while Peter’s secret identity protects everyone he loves. The Black Cat provides us with a mirror image of how Spider-Man might have turned out had he not had the steadying influence of Uncle Ben. 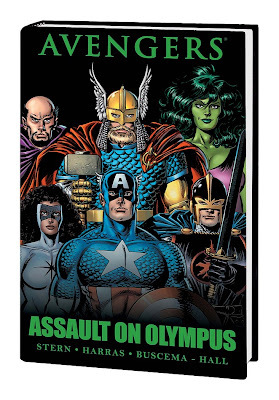 472 pages of Marvel 1980s fun! Now that the rights for my Black Cat article have reverted back to me, I thought I'd share it with out. 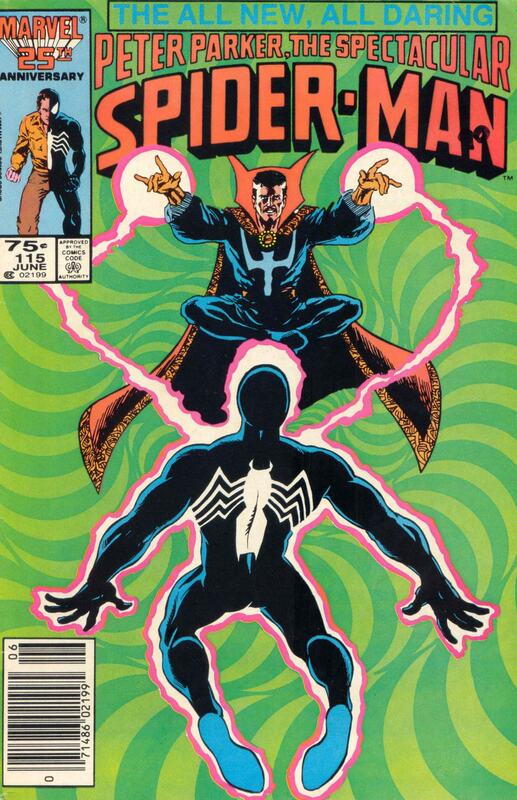 It was originally published in Back Issue! #40. If you enjoy it, please pick up a copy of Back Issue! magazine the next time you're at your local comic book store. There are villains that you love to hate, villains that are plot-device punching bags, and villains you truly sympathize with. Felicia Hardy, the Black Cat, is one of the latter. Classifying her as a villain is a bit of a misnomer though. While she’s broken the law as a cat burglar, Felicia is more of a self-absorbed rogue than your typical Spider-Man villain. 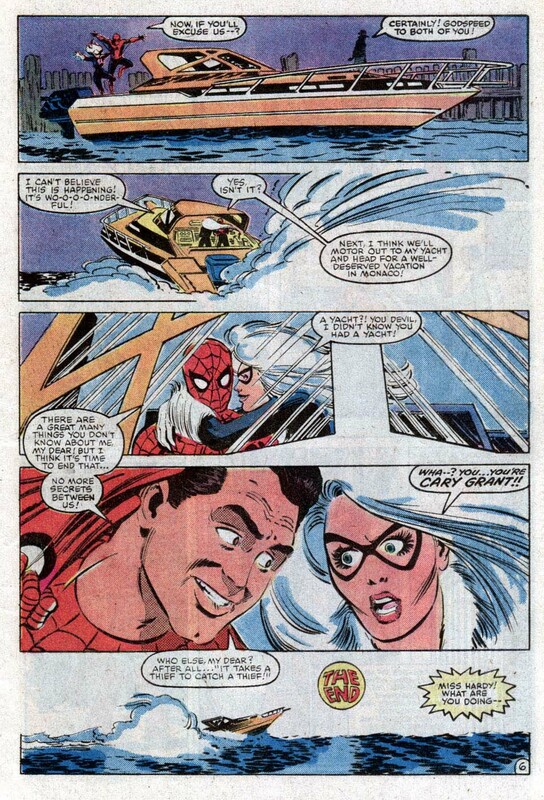 Throughout the Spider-Man titles of the 1980s, the Black Cat’s life became intertwined with Spider-Man’s. As with all good characters, she was defined by her weaknesses and flaws and how she dealt with them. Her all-too human side was no better portrayed through her efforts to cope with a variety of psychological issues. To properly understand who the Black Cat is, let’s start at the beginning and explore the forces that shaped her. The Black Cat pounced on to the scene in the pages of Amazing Spider-Man #194 (July 1979). 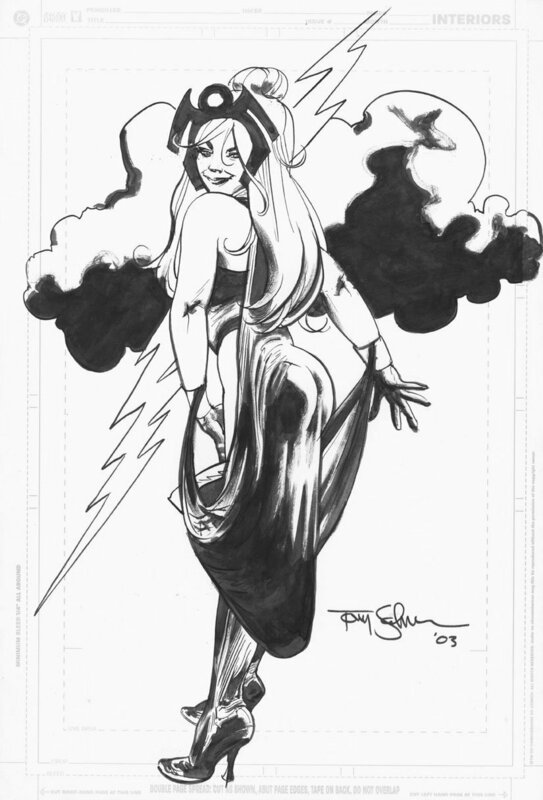 Classic 1970s artist Dave Cockrum provided the initial design for the Black Cat bringing her to life in a voluptuous fur-lined, skin-tight costume and collar. While Felicia Hardy’s costumed feline persona might remind you of DC’s notable cat burglar, Catwoman, Felicia is her own woman. 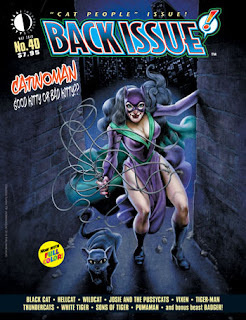 While they share some obvious characteristics, such as being burglars and deriving pleasure from playing cat-and-mouse games with superheroes, the Catwoman actually wasn’t the inspiration behind the Black Cat. 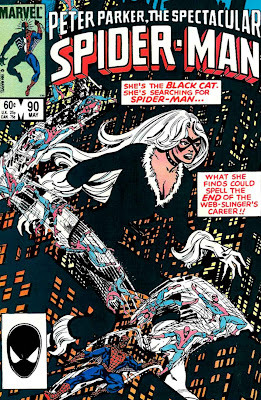 Amazing Spider-Man #195 (Aug. 1979) provides us with some insight into what molded Felicia’s Black Cat persona. Felicia grew up believing that her father, Walter Hardy, a world famous cat burglar, had died in a plane crash. Parental loss can leave a child, such as Felicia, with lingering doubts about their own self worth. Children can cope with the loss of a parent by idealizing that person. In Felicia’s case, she over-identified with her absent father. She developed an idealized fantasy life and drove herself to emulate that fictional lifestyle. This coping mechanism allowed her to deal with this emotionally traumatic event. She learned everything she could about her father and was particularly interested in his criminal exploits. She used these elements to build her idealized fantasy. Later, Felicia learned that her mother had lied to her about her father’s death. Walter Hardy was in fact still alive, but in jail. She took a bold step, making her debut as the costumed Black Cat to break him out. An important facet of her idealized view of her father was how it altered her morality. Despite his criminal tendencies, in her eyes, he could do no wrong and she applied that perspective to her own criminal actions. She wasn’t afraid to cross the line into unlawful territory, and proved to be resourceful, recruiting a criminal crew to assist her in the jail break. However, things aren’t always as they seem. Her father’s jailbreak wasn’t motivated by any criminal intent or desire, but rather by love. It was only when she heard Walter was dying that she selflessly decided to break him out. She’s emotionally deeper than her flashy exterior might convey and that’s what keeps the reader and Spider-Man so interested in her. Felicia’s carefree and thrill-seeking rogue persona is an internalized romantic image of her father. Her attraction to a masked adventurer, like Spider-Man, follows that romantic image. Similarly, you don’t have to look far down her relationship list to see that pattern, The Foreigner, Thomas Fireheart (The Puma), and even the heroic jock, Flash Thompson. 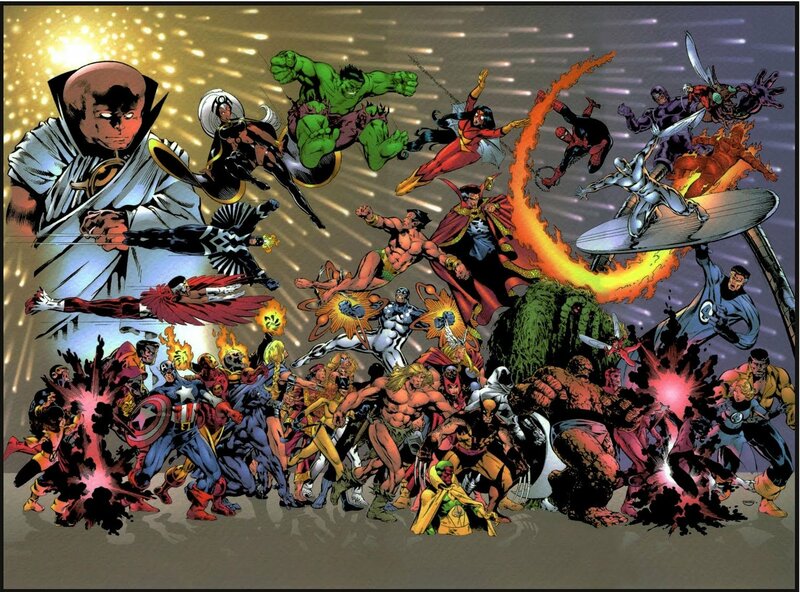 What an amazing piece by John Byrne! Always loved his Cyclops and Colossus. Hey Patricio: Whatever happened to Carl Potts? 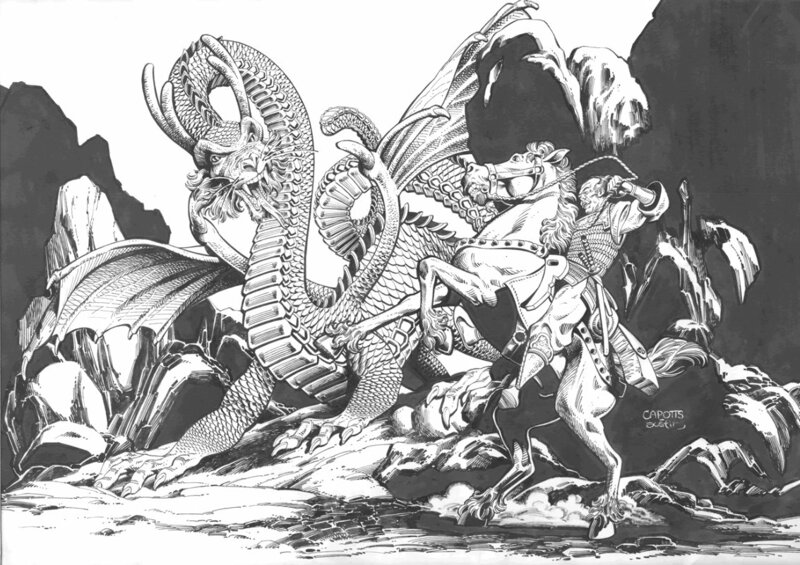 Carl Potts started his comic book career in the mid-1970s working for DC Comics and eventually made his way to Marvel Comics as an artist. 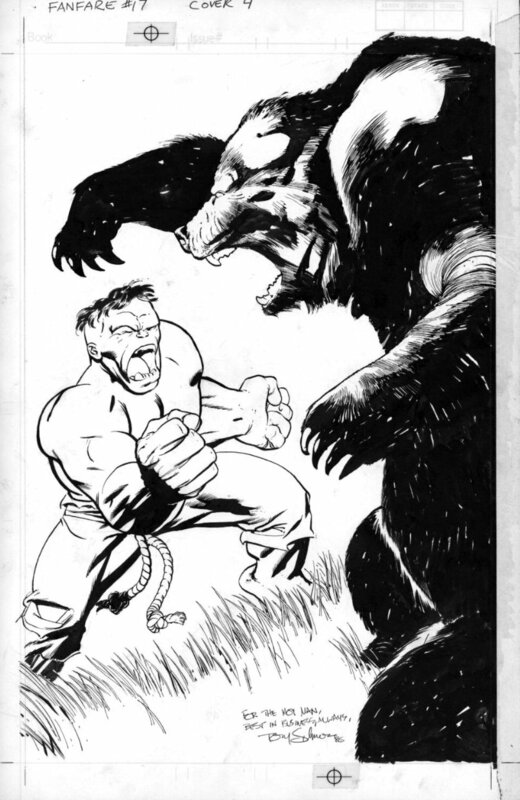 He then worked as an editor for Marvel Comics on Alpha Flight, The Defenders, Doctor Strange, The Incredible Hulk, Power Pack, and Strikeforce: Morituri. He also did several memorable fill-ins, such as Dr. 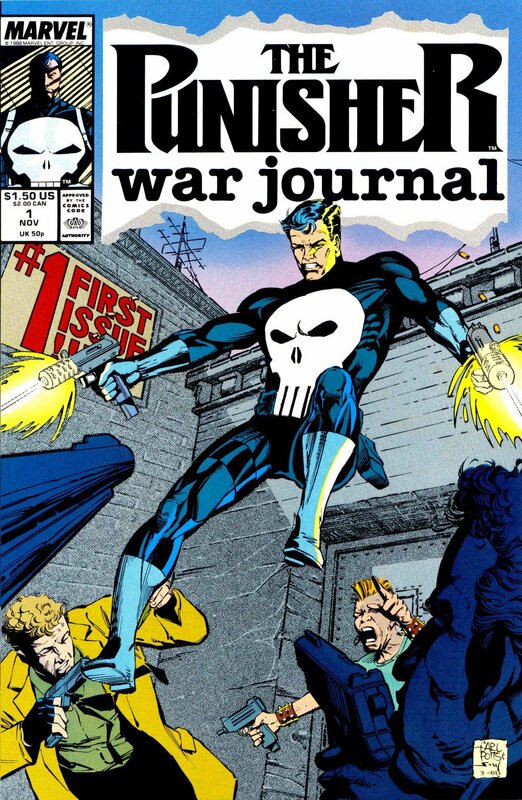 Strange #63, and wrote the first 24 issues of The Punisher War Journal. He helped Jim Lee and Art Adams break into comic books and in particular with Jim Lee, Potts provided the layouts for Lee’s pencilled art in the first dozen issues of The Punisher War Journal. "I went from freelance artist/writer to editor, overseeing about 5 monthly titles, a bunch of limited series, graphic novels, posters, etc. Mark Gruenwald was the only Executive Editor until around 1989 when I was promoted to Executive Editor, in charge of the Epic Comics imprint. As Exec. Ed., I found, developed and published numerous new titles for Epic and oversaw several editorial teams. Eventually, the position included overseeing a large part of the Marvel line as well. In the early '90s, Marvel had so many titles that there were three Executive Editors, each overseeing approximately 1/3 of the line. Bob Budiansky was the third Exec. Ed. We all answered to Editor-in-Chief Tom DeFalco and Publisher Mike Hobson. All three Executive Editors decided not to add our names to the already crowded credits on the Marvel titles. 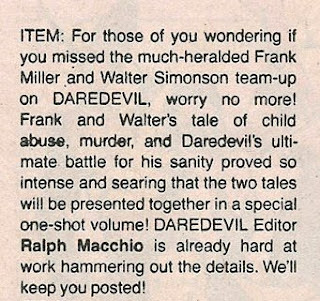 Therefore it wasn't easy for readers to tell which titles were produced by which Executive Editor (if they cared!). 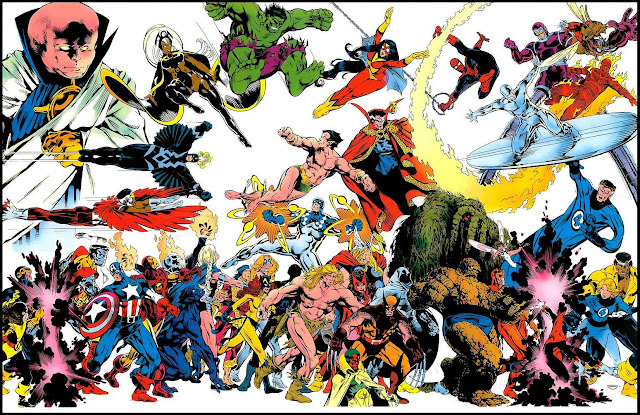 In late '94, Marvel reorganized into a number of different publishing divisions, each with its own Editor-in-Chief. I was EIC for the "General Entertainment" and "Epic" divisions. The higher in the ranks I got, the less creative and more bureaucratic the work became." 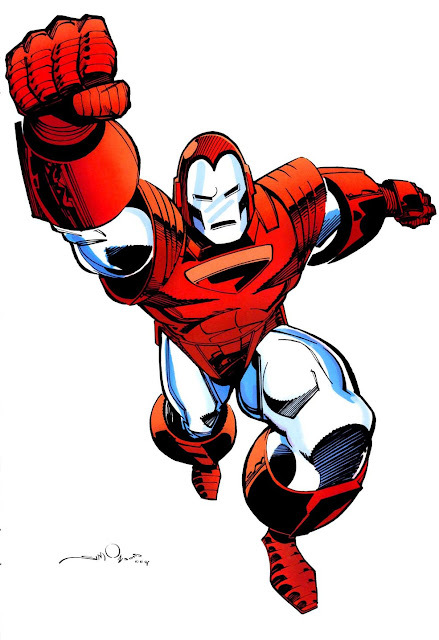 After more than a decade at Marvel Comics, Potts moved on to various roles as a creative director. 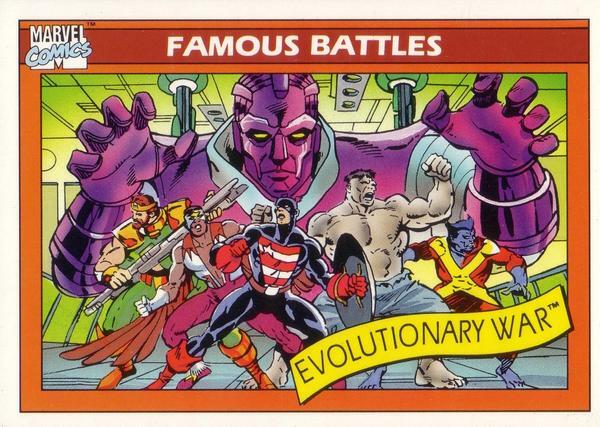 His blog, http://generaleclectic123.blogspot.com/, features some great 1980s moments and has some rare photos of the Marvel Bullpen back then. He is currently teaching "Drawing for Comics & Storyboards" at a college level. And recently, Disney and Jerry Bruckheimer purchased the rights for an Alien Legion film. 1986 - Whatever happened to Miller and Simonson on Daredevil? 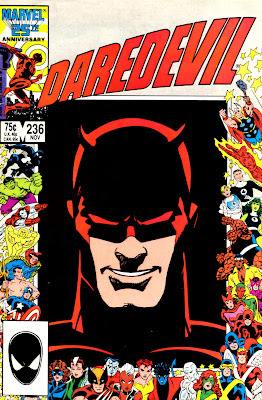 Hot off the heels of Frank Miller and David Mazzucchelli’s Born Again, Frank Miller and Walt Simonson (supplying the artwork) were supposed to team up for a two-part Daredevil story for issues #235 and #236. - Apparently, Dr. Strange was a guest-star in this story. - Miller only wrote the first half. (Kuljit Mithra actually has a copy of this script. - The two-part story was called “The Devil's Own". "To the best of my knowledge, Frank never scripted Part 2. I never did pencil Part 1. 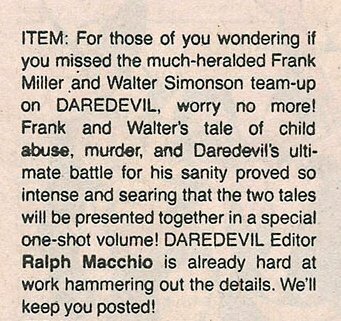 And the reason was that DD was getting a new regular writer [Steve Englehart/Ann Nocenti] at the time after several fill-ins. The new writer wanted his first issue to come out at the beginning of the summer (the good sales period back then) so our 2 parter was put on hold for a few months. And if there's no deadline, the work never gets done--that's an old freelance rule. The gist of it is that by the time Marvel was interested in having us work on the story, Frank was off doing Dark Knight and I was off doing X-Factor. So it never happened. Too bad--it was a cool story too." Hey Marcelo: Whatever happened to Tony Salmons? 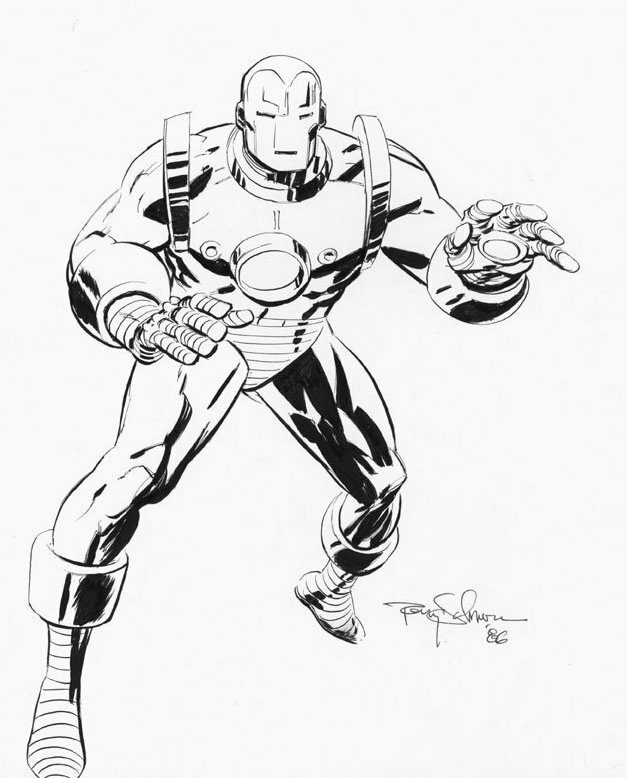 Tony Salmons saw the highlight of his comic book career in the mid-1980s, making a name for himself on Dakota North, Dr. Strange, GI Joe, Marvel Fanfare, and Savage Sword Of Conan. After that, he wasn’t very prolific bouncing around Dark Horse Comics, First Comics, and DC where he enjoyed a bit of a resurgence. He was also a storyboard artist for one episode of Batman: The Animated Series. I recall not being into his art back in the 1980s and his art certainly is an acquired taste. Even today, some of his sketch work is hit or miss. Unfortunately, his website, http://www.tonysalmons.net/, remains unfinished and a lot of his art can be found online with a google search.